Mr. Smith has a 42 year involvement in the financial services industry. 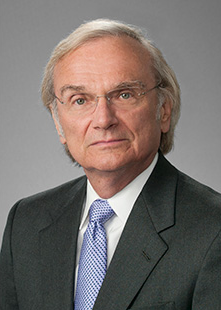 His roles have included as SVP General Counsel and Corporate Secretary of MasterCard International where he was a member of the Office of the President; as Chief Counsel and Member of the Policy Group of the Office of the Comptroller of the Currency and, as a senior partner in several multinational law firms – most recently Latham & Watkins, LLP – where he headed those firms’ financial regulatory practices. Mr. Smith is a recognized expert in the laws and regulations applying to banks and other financial services firms and in payments systems and products. His considerable experience includes: Financial Services, Bank Regulation, Payment Systems and Products, eCommerce and Financial Services Technology. He has been an active participant in most of the major developments in financial services over his professional life and has advised clients on responding to several major ( U.S. and foreign ) economic downturns . He has advised U.S. and offshore financial institutions, non- bank financials, payments systems and product providers, investors in financial firms and the vendors and advisors ( accountants, consultants, investment advisors and the like ) providing products or services to banks and other financial services firms. His career has included strategic planning, business operations experience and, of course, legal services across a wide range of geographies. For his many contributions to the Financial Services Industry, Mr. Smith has long been recognized as a thought leader by the leading ratings services and his peers. He is a member of the Boards of Directors of several companies and of a charitable foundation.